You might want to check a thread I created this morning, titled "Slipper Clutch vs Center Differential vs Center One-Way Differential". There's no definitive answer, but Squeegie did post something with two links, both of which primarily haven't to do with the F/R diffs. However, the first link (a REALLY long thread) did have several posts related to center diffs). However you look at it, the info is extremely useful. ~ Coming to you live, from somewhere on planet Earth. Revo clutch. 5352R and 5351. Simple,effective and cheap. 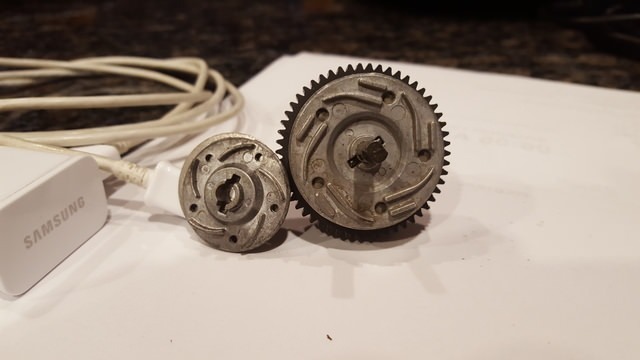 Those are the exact same parts already used for the Rustler 4x4 & Slash 4x4. It's a slipper clutch. What I was suggesting...center differential...should be alot better. The exploded view for the Slash 4x4 shows 5556 and 5552x. The 5352R/5351 is aluminum pads which I feel make a better unit. I beat mine hard with 1/8th scale power on 3 and 4s. Thought the OP was asking about slipper clutch upgrades not center diff upgrades. Last edited by Dcuda69; 02-09-2019 at 01:42 AM. First, I want just referring to the pre-installed parts of the vehicles mentioned...I was also referring to the optional parts, and, by that, the same parts area listed. If you check all these vehicles, you will find that, between the stock & optional parts, the same numbers are mentioned. Second, the OP did ask about upgrades to the slipper, and that could include upgrading from a slipper, to a differential. Now, if he/she is only interested in replacing the slipper with another slipper, I would recommend the Robinson Racing Slipper Unit, which comes with a 54T spur gear installed, but also has an optional 50T spur gear. I am considering the slipper clutch only because it's a bash truck. I am still new to the hobby and not quite ready for racing just yet. I did some research and if you are going to bash the truck then stay with a slipper clutch. I do appreciate all the information on the possible options of a center diff. +1 on the revo slipper. Upgrade has been done for years by many, simple, works, nuff said. Panther a little history lesson for you, the pioneers of slashes on 6s always used the revo slipper because they’d melt the stock ones all the time. It’s a simple but very effective upgrade . Yes center differentials may be “better” handling wise, but nowhere close to the revo slipper durability wise, which is what I believe the op is going for. You can go Robinson Racing but from personal experience steel spur gears just aren’t the wave. Plastic ones work just fine and if a rock gets stuck between it just strips the spur instead of snapping your $100 motor’s shaft. If mesh is set right you shouldn’t ever be able to strip a plastic spur unless by some sort of drivetrain lockup. Last edited by Peeeenuuutt; 02-09-2019 at 10:54 AM. Also just seen a video on doing the revo slipper clutch upgrade/modify. Makes sense with changing the pads for a more surface area for bite. Here is the video I watched. This is not intended to be a "suggestion", but curiosity had got ahold of once again. What about the HR Center One-Way Diff? It's somewhat like a center diff, but I'd actually closer to a slipper. As I understand it, under acceleration & 'constant speed', it acts like a slipper, with equal & constant power to front & rear. However, during braking, as well as 'coasting', power is only to the rear wheel, as the front is effectively disengaged. Like I said, not a "suggestion", but more of an "inquiry". While I'm going to stick (for now) with the slipper in the current Rusty 4x4, the Slash 4x4 & Rusty 4x4 projects will both have center diffs. 1 way diffs are cool but I’ve never had the balls to put one in any of my rigs as I don’t have anything where I want braking limited to the rear wheels as of yet. I've tested with a one-way clicker (as it's usually called) for 4WD cars, the one I have for my 22-4 2.0 buggy has a normal slipper under acceleration, and a limited slip adjustable clicker to allow the front wheels to free-wheel under braking. So it basically acts like a 4WD slipper on-power, and a 2WD rear wheel off-power. IMO, there really is no advantage to this system, as braking is more effective on the front wheels since they load up and weight transfers to the front, so yeah I suppose if you want the rear end sliding around everytime you brake, it works, but that's almost never the fastest way around the track. The HR looks even worse, because I think you have a locked spool on power, so you don't even have a slipper to help manage traction/drivetrain protection. Member of the 10,000 + posts club! Here to help! What mods did you do to fit it. Someone said they can be too thick...or something along those lines. You have it on the Revo plate...correct? I do. The only real mod is to enlarge the holes in the disc that mount it to the slipper plate.